Almost as good as grandma's. Try some comfort today. 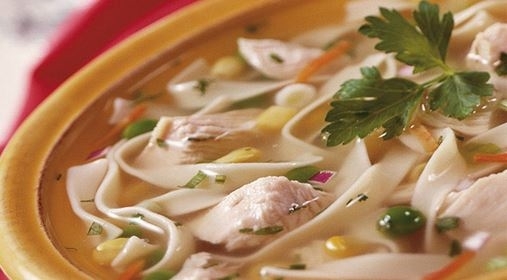 Chicken soup for your cravings. Don't miss this meal in minutes: Chicken, colorful peas, carrots, and corn are delicately seasoned with dill and combined with gluten free corn pasta for a delightful family favorite. 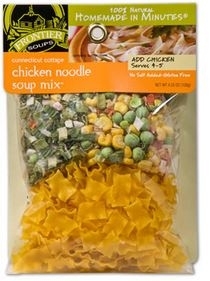 Ingredients: Lasagne corte (gluten free corn pasta), carrot, onion, corn, peas, celery, shallot, scallion, garlic and spices. 6 oz. (about 3 cups) cooked chicken breast, cut up grilled, poached or roasted are all good or even canned chicken for campers. We feature hearty soup recipes that can be used as your liquid meals for days 1 and 2 of the 5DPT (5 Day Pouch Test). Feedback from the pouch test suggests that liquids, such as broth or protein shakes, for some are not satiating and some are struggling to get past the first two days of liquids in order to make the test work. These soups meet the protein requirement, the liquid requirement and they include enough fat and carbohydrate to fuel your body during the Pouch Test leaving you energized and satiated. In addition, these recipes will help regulate your metabolic hormones: insulin and glucagon, which if you have been in a carb cycle are out of balance. Copyright © LivingAfterWLS Bookstore. All Rights Reserved. Built with Volusion.